The Russian BRDM-1 4×4 Armoured Car (Bronirovannaya Razvedyvatelnaya Dozornaya Mashina) was developed and manufactured in the former USSR (Russia) for the roles of either reconnaissance or Command & Control in the Russian Army and other WARSAW pact countries. It entered service in Russia during 1957. Production was completed by the Molotov GAZ plant in Gorkiy, Russia. Production ran until 1966 when it swapped to the improved BRDM-2 (the BRDM was then re-designated the BRDM-1) and a total of 10,000 BRDM-1’s were built. The vehicle is a all-welded steel construction offering protection from Machine Gun fire. The engine is located at the front, then the crew compartment with the driver sitting on the left and the commander to his right. The rest of the compartment behind them is used to accommodate the various equipment dependant on role. Access to the crew compartment was via roof hatches. Wheeled reconnaissance vehicles offer greater mobility on the road compared to track vehicles, but can not match their off-road mobility. To improve on the BRDM-1’s off-roading, it has a pair of retractable powered wheels on either side of the vehicle between the front and rear standard wheels. They are lowered when going off road to provide additional traction and power over rough terrain. It also had a central tyre pressure system that could increase or lower the air in tyres to assist in off-roading. 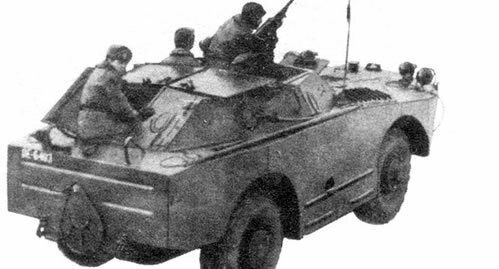 To cope with the multitude of rivers running through North Europe, which was the anticipated battlefield if fighting had broken out during the Cold War, the BRDM-1 has a large single water-jet in the rear of the vehicle to power it across these rivers so as to conduct reconnaissance for the following Russian Armoured Fighting Vehicles. A trim vain would be erected at the front and internal bilge pumps switched on to pump any water that was taken onboard. 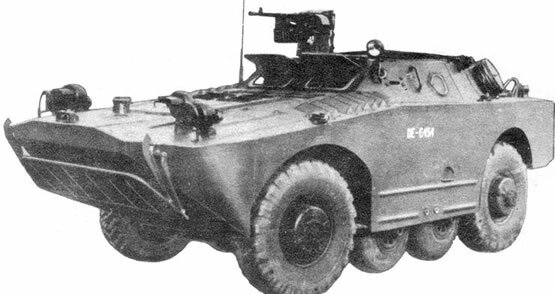 BRDM-1 Model 1957 was the initial design to enter service. It had an open roof. 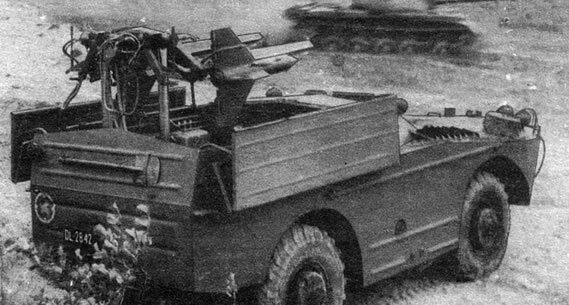 BRDM-1 Model 1958 had the open roof replaced with an enclosed one and access hatches. These were also used by to operate the forward facing mounted 12.7mm heavy Machine Gun and the rear facing 7.62mm MG by the x3 embarked troopers when used in the reconnaissance role. It was the model that was most produced. BRDM-U was the command and control vehicle. It carries the radio equipment and field commanders in the crew compartment, with a total of x4 radio antennas mounted on the exterior. BRDM-Rkhb was the radiological and chemical reconnaissance vehicle. It had various sensors for testing of contaminated ground/air and two flag dispensers mounted on the rear which would be laid to mark a safe path for following vehicles through contaminated area’s. Anti-Tank was another role the BRDM-1 was used for. It had a launcher that was raised from the crew compartment. Through out its service life various anti-tank missiles were used with different launchers, the Snapper (x3 firing tubes in the launcher) the Swatter (x4 firing tubes in the launcher) and Sagger (x6 firing tubes in the launcher). These missiles would be guided on to their targets via a crew member who used a sight to track the target and would make flight corrections to the missile via a control panel which sent these corrections via wires attached to the missile and the launcher, hence the term Wire Guided Anti-Tank Missile. Albania, Bulgaria, Congo, Cuba, Guinea, Kazakhstan, Mozambique, Sudan, Vietnam and Zambia. Though many, these include Czechoslovakia, former East Germany and Poland as well as Middle-East countries during various Arab Wars.